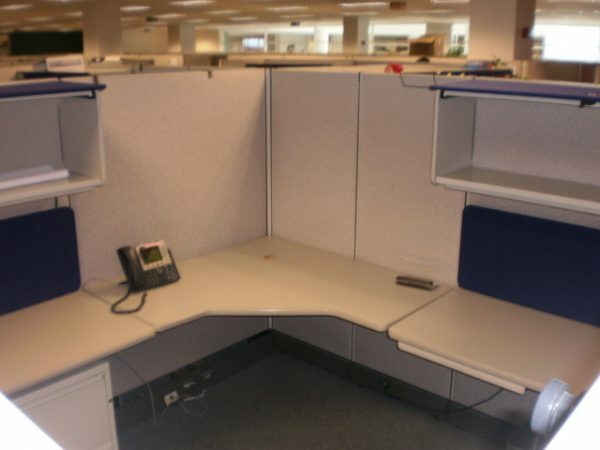 AO2 8×8 workstations that can be reconfigured into 6×8 or 8×6. Each station has a 24×48 corner with (2) 24×48 return surfaces that can be cut into 24×24 returns if needed. Plenty of 24×67 panels in this inventory to support the 6×8 or 8×6 station size. each station has a Meridian BBF and two-drawer lateral file. The 48″ flipper door is covered with a navy blue fabric as well as the 48″ wide tackboard. These can be reupholstered to help the station match your existing color scheme. Panels down center spine are powered.